The past few days, I attended a conference not about my field of research but about current and future technology for home energy saving, careers after academic and biological sensors. During that time, I enjoyed life in Eden with outdoor activities, and great food. Just to tell you, I ate a lot. I managed to pick up a few recipes from the chefs. I will make them in the future. At my collective cooking, I had to use the remaining of the cannelloni pasta, and at the last minute, on EEE, I found this recipe. I always wanted to combine two kinds of meat and see the results. 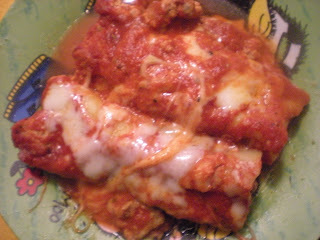 I made a few changes to the recipe as the uncooked cannelloni pasta are smaller than the cooked manicotti. 1. In a large skillet, heat oil over medium-high heat. Cook onion until transparent, then add garlic and cook until fragrant. 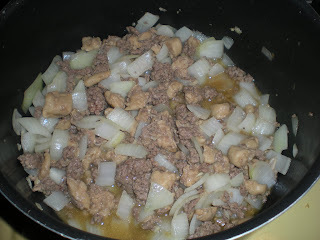 Add ground beef and sausage until browned. Drain fat and set aside. 2. 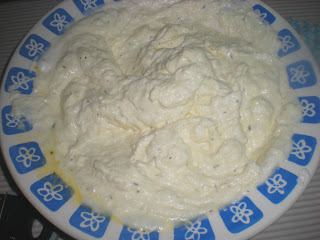 Combine ricotta, egg, parmesan and parsley. Add salt and pepper to taste. 3. 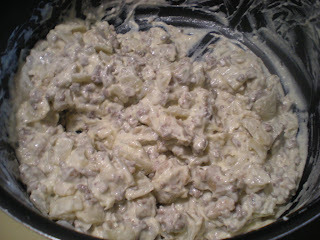 Combine meat mixture with cheese mix. 5. Spread half of the tomato sauce at the bottom of a 13 x 9 inch baking pan. Add 1 tbsp of Italian seasonings. 6. Transfer all the filling into a pastry bag or plastic bag. If plastic bad is used, cut one corner and fill the cannelloni pasta. 7. 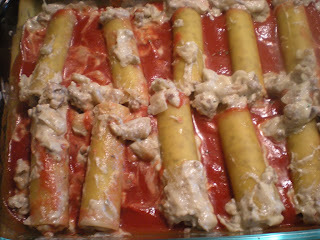 Lay each cannelloni onto the sauce. 8. Top with the remaining sauce and Italian seasonings. 9. Bake for 40 mins. Remove pan from the oven and top with the mozzarella cheese. Bake for 5 more minutes. Serve.